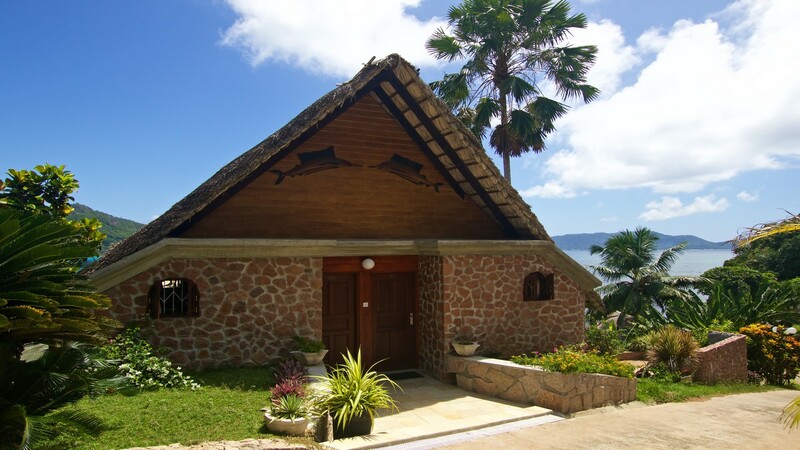 TERMS AND CONDITIONS FOR USE OF THIS WEBSITE AND/OR THE SERVICES OFFERED VIA THIS WEBSITE BY THE HOTELS TRADING AS: (i) CHALETS COTE MER; and (ii) COLIBRI GUESTHOUSE each of Pointe Cabris, Baie Ste Anne, Praslin, Seychelles (together herein referred to as the “Hotel”). The Hotel provides the information and services offered to you via this website ("services") subject to the terms and conditions set out herein. By accessing the Hotel website ("website") and using any of the services and information offered via the website from time to time you shall be deemed to have agreed to all the terms and conditions set out herein. The Hotel may at any time modify these terms and conditions and your continued use of the website will be subject to the terms and conditions in force at the time of your use. Accordingly you agree to review these terms and conditions periodically, and your continued access or use of the website shall be deemed to be your acceptance of the amended terms and conditions of the website. Terms and conditions relating to special offers, which are, from time to time, contained elsewhere on the website, shall, to the extent that those terms and conditions conflict with the terms and conditions contained in this Agreement, take precedence over the conflicting provisions of this Agreement. (a) The Hotel’s reservations feature of this website is provided solely to assist you in determining the availability of travel-related goods and services and to make legitimate reservations. You agree to be financially responsible for any financial transactions made by you on this website (as well as for use of your account by others, including without limitation any person under the age of eighteen years of age). You agree that the reservations facilities of this website shall be used only to make legitimate reservations. You understand that overuse or abuse of the reservation facilities of this website may result in you being denied access to such facilities, at the sole discretion of the Hotel. (a) For any reservations or other services for which fees may be charged, you agree to abide by these terms and conditions as well as, that payment of all amounts shall be paid by you when due and that you shall comply with all rules and restrictions regarding rates and charges as well as in respect of the availability of products or services. You shall be completely responsible for all charges, fees, duties, taxes, and assessments arising out of the use of this website. Whilst every effort is made to update the information provided on this website on a regular basis, the Hotel makes no representations or warranties, whether express, implied in law or residual, as to the accuracy, completeness or reliability of information contained on any of the pages comprising the website and shall not be bound in any manner by any information contained on the website or any of the pages comprising the website. The Hotel reserves the right at any time to change or discontinue without notice, any aspect, feature or service offered by way of this website. No opinions, information, data or content contained on the website shall be construed as advice and same are offered for information purposes only. The Hotel gives no warranties and makes no representations as to the accuracy, completeness or reliability of any such opinions, information, data or content. This website is solely for your personal and non-commercial use. Copyright and all intellectual property rights in all materials made available through this website are owned by the Hotel. The Hotel is the lawful user thereof and is protected by Seychelles and international intellectual property right laws. Accordingly, any unauthorised copying, reproduction, retransmission, distribution, dissemination, sale, publication, or other circulation or exploitation of such material as aforesaid or any component thereof will constitute an infringement of such copyright and other intellectual property rights. The trademarks, names, logos and service marks (collectively "trademarks") displayed on this website are registered and unregistered trademarks of The Hotel alternatively The Hotel are the lawful users of the trademarks. Nothing contained on this website should be construed as granting any licence or right to use any trademarks without the prior written permission of the Hotel. External links may be provided for your convenience, but they are beyond the control of the Hotel and no representation is made as to their content. Use or reliance on any external links provided is at your own risk. When visiting external links you must refer to that external website's terms and conditions of use. No hypertext links shall be created from any website whether controlled by you or otherwise to this website without the express prior written permission of the Hotel. (a) You acknowledge and agree that the Hotel shall be entitled to establish the authenticity of any communication transmitted to it by way of the Internet which purports to emanate from you. You agree that all instructions, consents, commitments, reservations and any other communications which purport to emanate from you and which are sent to the Hotel by way of the Internet and which may (as a result of, inter alia, interception, equipment malfunction, the distortion of communication links or any other reason whatsoever) be different from the details actually sent or given, or may not have been given by you at all, shall be deemed to have been given by you in the form actually received by the Hotel and you will be bound by such details with no liability of whatever nature attaching to The Hotel in regard thereto. (b) You waive any rights you may have or obtain against the Hotel arising directly or indirectly from any loss or damage of whatsoever nature which you may suffer as a result of the fact that the Hotel acts on your instructions or instructions purported to emanate from you. You agree to and hereby indemnify the Hotel against all and any claims, liabilities, losses, costs, fines, damages and expenses incurred (whether directly or indirectly) by you, arising as a result of the fact that The Hotel has acted on your instructions or instructions which purport to emanate from you. The Hotel will use reasonable endeavours to maintain full system availability, except during scheduled maintenance periods. The Hotel shall not be responsible for and disclaims all liability for any loss, liability, damage (whether direct, indirect or consequential), personal injury or expense of any nature whatsoever which may be suffered by you or any third party as a result of or which may be attributable, directly or indirectly, to your use of or reliance on any information provided on and via the website or any pages of the website, any e-mails sent from the website, services provided via this website, any viruses that may infect your computer or other property on account of your access to and/or use of this website, use of content, data or information made available via the website, any failure, delay or unavailability of the website or any services offered via the site for any reason whatever and the supply, or failure or delay in supplying any of the services offered via the website and you indemnify and hold harmless The Hotel in respect of any loss, liability, damage (whether direct, indirect or consequential) or expense of any nature whatsoever, which may be suffered by you or any third party as a result of or which may be attributable, directly or indirectly, to any of the aforesaid. 2.1 You warrant that every instruction and all information given by you to the Hotel shall be accurate, true and correct. 2.2 The Hotel makes no warranties, representations, statements or guarantees (whether express, implied in law or residual) regarding the website, any services provided via this website or the suitability of any of the services for a particular purpose. As the Hotel provides certain services to you via the Internet, the Hotel makes no representations, nor gives any warranties or guarantees of any nature as to the availability of any communications network or systems of any third party on whom you or the Hotel rely to provide any of the services. 3.1 Your privacy is very important to the Hotel. To help protect your privacy, we adhere to the following guidelines. 3.2 The Hotel will explicitly ask when they need information that personally identifies you or allows them to contact you ("Personal Information"). Generally this Personal Information is requested when making reservations, when requesting a particular service or when sending feedback. 3.3 The Hotel will use your Personal Information to operate the sites, provide services, and to inform you of new features, services, and products, to enable us to process, validate and verify reservation and requests for services and for the purposes for which you specifically provided the information; to improve your experience on our website; to improve and develop new features and services; to alert you to new services and special offers and for other purposes. 3.4 Should you not wish us to use the Personal Information, please send an e-mail providing so to ccmer@seychelles.net. 3.5 The Hotel shall be entitled to disclose Personal Information if required to do so to (a) comply with applicable law or with legal process served on the Hotel; (b) to protect and defend the rights or property of the Hotel, and (c) for the purposes of distributing same to various third parties who are involved in the provision of the services provided in accordance with these terms and conditions. 4.1 Any claim, dispute or impasse relating to these terms and conditions shall by governed by the laws of the Republic of Seychelles without giving effect to any principles of conflict of law. You hereby consent to exclusive jurisdiction of the Seychelles Courts in respect of any disputes arising in connection with the services referred to herein, or these terms and conditions or any matter related to or in connection therewith. 4.2 These terms and conditions constitute the entire agreement of the parties with respect to the subject matter hereof and supersedes all prior oral and written agreements. No failure or delay on the part of The Hotel in exercising any right or remedy hereunder or enforcing the terms and conditions of this Agreement will operate as a waiver thereof. Headings are for convenience only and not for use in interpretation of these terms and conditions. 4.3 These terms and conditions constitute the entire agreement of the parties with respect to the subject matter hereof and supersedes all prior oral and written agreements. No failure or delay on the part of The Hotel in exercising any right or remedy hereunder or enforcing the terms and conditions of this Agreement will operate as a waiver thereof. Headings are for convenience only and not for use in interpretation of these terms and conditions. 4.4 All provisions of these terms and conditions are, notwithstanding the manner in which they have been grouped together or linked grammatically, severable from each other. Any provision of these terms and conditions which is or becomes unenforceable in any jurisdiction, whether due to voidness, invalidity, illegality, unlawfulness or for any reason whatever, shall, in such jurisdiction only and only to the extent that it is so unenforceable, be treated as pro non scripto and the remaining provisions of these terms and conditions shall remain in full force and effect. 4.5 Delay or failure to comply with or breach of any of these terms and conditions if occasioned by or resulting from an act of God or public enemy, fire, explosion, earthquake, perils of the sea, flood, storm or other adverse weather conditions, war declared or undeclared, civil war, revolution, civil commotion or other civil strife, riot, strikes, blockade, embargo, sanctions, epidemics, act of any Government or other authority, compliance with Government orders, demands or regulations, or any circumstances of like or different nature beyond the reasonable control of the party so failing force majeure, will not be deemed to be a breach of these terms and conditions nor will it subject either party to any liability to the other. 4.6 Should either party be prevented from carrying out its obligations by force majeure lasting continuously for a period of 30 (thirty) days, the parties will consult with each other regarding the future implementation of these terms and conditions. If no mutually acceptable arrangement is arrived at within a period of 30 (thirty) days thereafter, The Hotel shall be entitled to terminate all of its rights and obligations in terms of or arising from these terms and conditions and/or any service forthwith on written notice. 5.1 The Guest, by signing the registration form upon check-in, warrants that he is duly authorised to sign for and bind all persons represented by him or for whom he is responsible or for whom he is arranging accommodation (‘his party’) to these Terms & Conditions Residence and, failing such authority, agrees to be personally liable for all amounts arising from the residence of himself and his party at Chalets Cote Mer & Colibri Guesthouse (the ‘Hotel’). 5.2 The Guest and each of his party agree to pay the room rate at the time of check-in, unless agreed otherwise with the Hotel’s management. Furthermore, the Guest and each of his party agree to pay no later than the time of departure (unless prior written arrangements have been made with the Hotel’s management) any cost relating of food, beverage and any other amounts relating to such residence incurred by the Guest and his party during his stay at the Hotel. Periodic payments must be made if the account exceeds the credit limit designated by the Hotel, and accounts are payable on presentation. 5.3 A certificate from the Hotel manager shall constitute primae facia proof of indebtedness of the Guest and/or his party and of the particulars therein for all purposes, including any action instituted by the Hotel against the Guest and/or his party. 5.4 The Guest agrees that after his departure, the Hotel may retain goods left behind by him and/or his party and authorises the Hotel, after giving one month’s notice to the domicilium address, of its intentions to do so, to sell same privately or publicly at the Hotel’s discretion, at such price as the Hotel may determine and off-set the proceeds of such sale against any indebtedness of the Guest and/or his party and any balance shall be deemed to have been forfeited to the Hotel. The Guest and each of his party agree that the Hotel shall have a lien over all items brought by any of them onto the Hotel premises for all amounts due to the Hotel by and of them, no matter how and when such debt was incurred. 5.5 The Guest hereby agrees, on his behalf and on behalf of the members of his party, that it is a condition of his residence at the Hotel, that neither the Hotel, its landlord, employees nor agents shall be responsible for any injury to or death of any person or the loss or destruction of or damage to any property or any damages of any other kind, including but not limited to, pure economic loss, whether arising from fire, theft or any other cause of whatsoever nature or kind and by whomsoever caused, whether arising from the negligence (gross or otherwise) or wrongful act of any person in the employ of the Hotel or otherwise. The Guest and his party hereby waive all such claims and furthermore hereby indemnify and hold harmless the Hotel and such persons against any claim, as contemplated above, that may be made against the Hotel or such person by the Guest, his party or any person occupying the room together with the Guest or any invitee of the Guest. 5.6 The Guest chooses domicilium citandi et executandi for all purposes at the address set out on the face of these Terms & Conditions of Residence. 5.7 The Terms & Conditions of Residence constitute the whole agreement between the Hotel and the Guest and/or his party and no warranties or representation, whether express or implied, not stated herein, shall be binding on the parties and no alternations hereto or waivers made shall be binding unless in writing. 5.8 The Guest hereby agrees to the Hotel Cancellation Policy. The Guest and each of his party agree to pay the full value of the stay should the Guest and or his party leave prior to the original departure date. A charge of 30% of the booking amount will be applied at the time of confirmation of the booking (by receipt of a confirmation email from the Hotel). The balance will be due 30 days before arrival. 7.1 A charge of 30% of the booking value will be charged if the booking is cancelled more than 30 days prior to arrival. 7.2 If cancelled fewer than 30 days before the date of arrival, or in case of no-show, the full booking amount will be charged.